Silverberg, Robert. Roma Eterna . HarperCollins/Eos 2003. Silverberg, Robert. Roma Eterna . HarperCollins/Eos 2004. Silverberg, Robert. Roma Eterna . Gollancz 2003. What if: The first Exodus failed on the shores of the Red Sea, preventing the rise of Christianity. Fifteen centuries later the two branches of the Roman Empire assisted each other against invasions from barbarians and Persians, and the empire(s) continued to dominate Europe and the Mediterranean for another two millennia. Series note: Collection of previously published stories all set in the same timeline. In internal chronological order, the stories are "A.U.C. 1203. Prologue", "With Caesar in the Underworld", "A Hero of the Empire", "The Second Wave", "Waiting for the End", "An Outpost of the Empire", "Getting to Know the Dragon", "The Reign of Terror", "Via Roma", "Tales from the Venia Woods", and "To the Promised Land". Published: HarperCollins/Eos 2003 (0380978598w88 android), 2004 (0380814889BUY); Gollancz 2003 (0575073535, 0575073543). Translation: French by Jean-Marc Chambon as Roma Æterna , Laffont 2004 (2221098544). Awards: Finalist: 2003 Sidewise Award for best short-form alternate history. Silverberg, Robert. "A.U.C. 1203. Prologue"
Summary: Short introduction to the divergence point of the Roma Eterna cycle, as one historian postulates to another a what-if of an obscure tribe of Aegyptian slaves. Series note: A Roma Eterna story. Published: In Roma Eterna , q.v. Silverberg, Robert. "With Caesar in the Underworld"
Summary: In c. 1282 AUC (529 CE), an ambassador from the eastern empire expresses a desire to see the seamy underside of Rome. Published: In Asimov's Science Fiction , October/November 2002; Roma Eterna , q.v. ; and Phases of the Moon: Stories from Six Decades , Subterranean 2004 (1931081999BUY), v.t. Phases of the Moon: Six Decades of Masterpieces by the SFWA Grand Master , ibooks 2004 (0743498011BUY). Awards: Finalist: 2002 Sidewise Award for best short-form alternate history. Silverberg, Robert. "A Hero of the Empire"
Summary: In c. 1370 AUC (617 CE), a western Roman diplomat exiled to Arabia Deserta encounters a charismatic merchant who intends to overturn the belief in hundreds of Arabic gods in favor of just "the god", and realizes that this man could eventually pose a threat to Rome itself. Published: In The Magazine of Fantasy & Science Fiction October/November 1999; Roma Eterna , q.v. ; and One Lamp: The Best Alternate History Stories from F&SF (ed. Gordon Van Gelder), q.v. Awards: Finalist: 1999 Sidewise Award for best short-form alternate history. Silverberg, Robert. "The Second Wave"
Summary: In 1861 AUC (1108 CE), the western Roman Empire sends seven legions across the great western ocean to attempt the conquest of "Yucatan", a land discovered by Norsemen. A prior invasion force failed miserably; will this second do better? Published: In Asimov's Science Fiction , August 2002; and Roma Eterna , q.v. Silverberg, Robert. "Waiting for the End"
Summary: In 1951 AUC (1198 CE), centuries after the western Roman Empire has fought off the barbarians of the north, it faces its most dangerous invader, the eastern Roman Empire of Constantinople. With the west drained by military losses in the New World and confronted on three sides, Caesar Maximilanus VI opts for peaceful surrender. Published: In Asimov's Science Fiction , October/November 1998; and Roma Eterna , q.v. Awards: Finalist: 1998 Sidewise Award for best short-form alternate history. Silverberg, Robert. "An Outpost of the Empire"
Summary: In 2206 AUC (1453 CE), 250 years after the subjugation of Rome to Constantinople, the tables have been turned. Now, a Roman proconsul is appointed to rule Venice, where he encounters a very Byzantine lady. Published: In Isaac Asimov's Science Fiction Magazine , November 1991; Roads Not Taken: Tales of Alternate History (eds. Gardner Dozois and Stanley Schmidt), q.v. ; and Roma Eterna , q.v. Silverberg, Robert. "Getting to Know the Dragon"
Summary: In 2503 AUC (1750 CE), during one of Rome's more decadent eras, an historian has the chance to study Trajan VII Draco's lost memoir of the circumnavigation of the globe 200 years earlier. Comments: Version published in Far Horizons includes a short introduction which outlines the course of the Roma Eterna alternate history and where each story (published by 1999) fits in. Published: In Far Horizons: The Great Worlds of Science Fiction (ed. 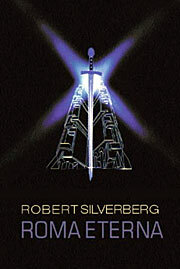 Robert Silverberg), Avon 1999 (0380976307BUY), 2000 (0380796945BUY), Little Brown/Orbit 1999 (1857239423); and Roma Eterna , q.v. Translation: Nederlands by Jan Smit as "Het Logboek van de Draak", in Verre Horizons (ed. Silverberg), Luitingh-Sijthoff 2000 (9024534968). Translation: French by Jean-Pierre Roblain as "A la rencontre du Dragon", in Horizons Lointains (ed. Siverberg), J'ai lu 2000 (2290304859). Silverberg, Robert. "The Reign of Terror"
Summary: In 2563 AUC (1810 CE), …. 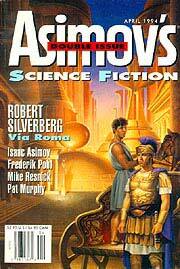 Published: Asimov's Science Fiction , April 2003; and Roma Eterna , q.v. Silverberg, Robert. "Via Roma". In Asimov's Science Fiction April 1994. Summary: In 2603 AUC (1850 CE), a well-to-do young Britannic visitor to Rome lands among the political "jet set" and ends up witnessing from the sidelines the bloody creation of the Second Roman Republic. 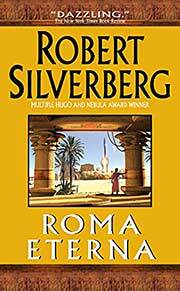 Published: In Asimov's Science Fiction , April 1994; and Roma Eterna , q.v. Silverberg, Robert. "Tales from the Venia Woods"
Summary: In 2653 AUC (1900 CE), early during the Second Roman Republic, two children meet a mysterious old man hiding in a ruined imperial hunting lodge in the Teutonic provinces. Published: In The Magazine of Fantasy and Science Fiction , October 1989; The Year's Best Science Fiction, Seventh Annual Collection (ed. Gardner Dozois), St. Martin's 1990 (0312044518, 0312044526), v.t. 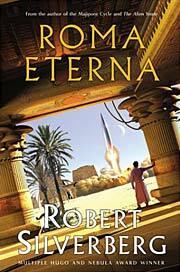 Best New SF 4 , Robinson 1990 (1854870572); Roma Eterna , q.v. ; and The Mammoth Book of Alternate Histories (eds. Ian Watson and Ian Whates), q.v. Translation: French by Hélègne Collon as "Légendes de la forêt Veniane", in Le nez de Cléopâtre , q.v. Translation: Italian by Barbara Fabbri as "Racconti dalle foreste di Venia", in Stelle di neutroni (ed. Gardner Dozois), Mondadori 1992 (8804360429). Silverberg, Robert. "To the Promised Land"
Summary: In 2723 AUC (2000 CE), 4000 years after the failed Exodus, the few remaining Hebrews in Egypt plan a new Exodus, to space, and recruit an historian to write their tale. Published: In Omni , May 1989; What Might Have Been? Volume 1: Alternate Empires (eds. Gregory Benford and Martin H. Greenberg), q.v. ; The Collected Stories of Robert Silverberg: Volume I, Secret Sharers , Bantam 1992 (055308996X, 0553370685); The Collected Stories of Robert Silverberg: Volume II, The Secret Sharer , Grafton 1993 (0586213708); and Roma Eterna , q.v.